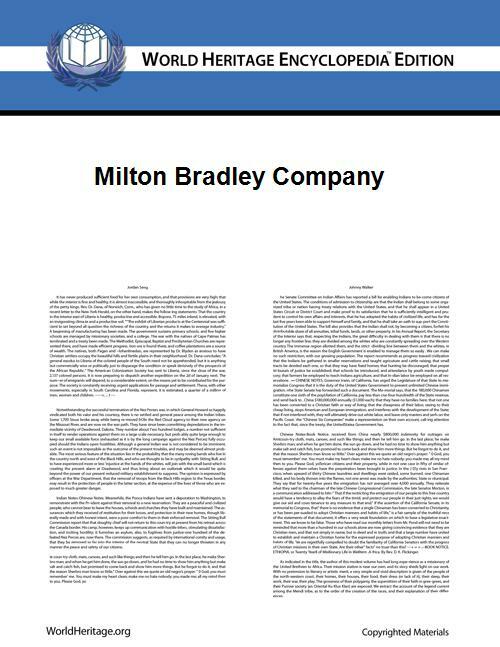 The Milton Bradley Company is an American board game company established by Milton Bradley in Springfield, Massachusetts, in 1860. In 1920, it absorbed the game production of McLoughlin Brothers, formerly the largest game manufacturer in the United States. Milton Bradley was taken over by Hasbro, Inc., in 1984. Now wholly owned by Hasbro, it is still retained as one of Hasbro's brands, similar to the manner in which former Milton Bradley arch-rival Parker Brothers is one of Hasbro's brands. Milton Bradley found success making board games people enjoyed playing. In 1860, Milton Bradley moved to Springfield, Massachusetts, and set up the state's first color lithography shop. His likeness of Abraham Lincoln sold very well until Lincoln grew his beard and rendered the likeness out-of-date. When the Civil War broke out in early 1861, Milton Bradley temporarily gave up making board games and tried to make new weaponry. However, upon seeing bored soldiers stationed in Springfield, Bradley began producing small games the soldiers could play during their down time. This is regarded as the first travel game in the country. These games included chess, checkers, backgammon, dominoes, and "The Checkered Game of Life." They were sold for one dollar a piece to soldiers and charitable organizations that bought them in bulk to distribute. ^ a b c d e f g h i j "Milton Bradley Company". Retrieved April 1, 2011. ^ a b "Milton Bradley Company". Retrieved April 3, 2011. In 1984, Hasbro, ending 124 years of family ownership, bought out Milton Bradley. Milton Bradley continued to turn out games that capitalized on current trends. The 1990s saw the release of Gator Golf, Crack the Case, Mall Madness, and 1313 Dead End Drive. Milton Bradley was sued by two men, Alan Coleman and Roger Burten, who claimed to have presented the original concept for Dark Tower to Milton Bradley in the late 1970s, at which point, MB declined to pursue it, but thereafter "independently" developed the game. One of the Dark Tower game designers claims the court's decision was unfair. As part of the resolution of the lawsuit, Milton Bradley pulled the game off the market, and it was never republished. In 1983, seeing the potential in the new Vectrex vector based video game console, the company purchased Good Consumer Electronic (GCE). Both the Vectrex and the Microvision were designed by Jay Smith. Although the Vectrex had a very short production run, new games are still being developed for it as of 2013. In 1967 James Shea Jr. took over as president of Milton Bradley (becoming CEO in 1968) succeeding his father. During his presidency, Milton Bradley bought Playskool Mfg. Co. the E.S. Lowe Company, makers of Yahtzee, and Body Language. Milton Bradley celebrated their centennial in 1960 with the re-release of The Checkered Game of Life, which was modernized. It was now simply called The Game of Life and the goal was no longer to reach Happy Old Age, but to become a millionaire. Twister made its debut in the 1960s as well. Thanks to Johnny Carson's suggestive comments as Eva Gabor played the game on his show, Twister became a phenomenon. In the 1960s Milton Bradley games were licensed in Australia by John Sands Pty Ltd. The advent of the television could have threatened the industry, but Shea used it to his advantage. Various companies acquired licenses to television shows, for the purpose of producing all manner of promotional items, including games. In 1959, Milton Bradley released Concentration, a memory game based on an NBC television show of the same name. Milton Bradley was an early advocate of Friedrich Froebel's idea of Kindergarten. Springfield's first kindergarten students were Milton Bradley's two daughters, and the first teachers in Springfield were Milton, his wife and his father. MiltonBradley's company's involvement with kindergartens began with the production of "gifts," the term used by Froebel for the geometric wooden play things that he felt were necessary to properly structure children's creative development. Bradley spent months devising the exact shades in which to produce these materials; his final choice of six pigments of red, orange, yellow, green, blue, and violet would remain the standard colors for children's art supplies through the 20th century.